Sussex have appointed all-rounder Luke Wright as their captain in all three formats of the game. The 30-year-old, who led the Hove side in the T20 Blast this year, replaces Ed Joyce, who stood down last week. "Once Ed had made his decision, the club asked if I was interested. It was a pretty easy decision to say yes," Wright told BBC Sussex. "I was proud and honoured to do the T20. Now I get to put my stamp on the whole club and I am excited about it." 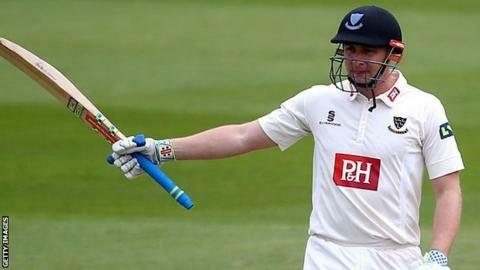 Ireland batsman Joyce, 37, stepped down after three-and-a-half years in the role and following Sussex's relegation from Division One of the County Championship. Wright, who joined Sussex from Leicestershire in 2004, has made 101 limited overs appearances for England in Twenty20 and one-day internationals and is a seasoned campaigner in the Indian Premier League and Australian Big Bash T20 competitions. He is optimistic that next season the club will be able to secure an immediate return to the top flight. "Relegation gives you even more drive, hunger and desire," Wright said. "We had an honest meeting as a group and things we have got to change. That is a great starting point. "We have a good squad but there are a few things I want to tinker with and, with the odd person coming in, hopefully we can get back to winning ways." Sussex cricket manager Mark Robinson said Wright would bring "passion, commitment and energy" to the role. "It comes at an important time for the club, as we look to rebuild and come back stronger for the 2016 season," Robinson said. "Luke will bring a lot of experience from around the world. He will have the full respect from everybody from within the club and the game."